Have you heard about PhatFiber? It's a new venture begun by partners Jessie and Marcus. 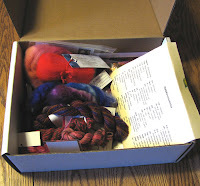 Each month they solicit samples from independen t fiber shops, then package those samples into PhatFiber boxes. Each box contains a minimum of 20 samples. The first round of PhatFiber packages was sold in January. I heard about it shortly after they were sold and decided to take part in the February boxes. If the sample contributors send a minimum number of samples, they receive a box for themselves! The photos you're looking at are my sampler box from February. What a wonderful array of goodies! 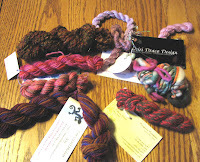 Raw fiber, roving, handspun, hand dyed yarn, stitch markers, patterns.... 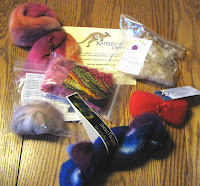 Enough to make me want to purchase indie fibers from a whole lot of sellers! And I suspect it'll be the reason I start spinning again (I haven't spun since I was in my mid-20s). 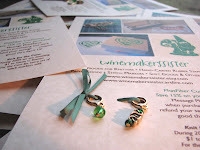 For March, I made up samples with a Celtic knot and a kelly green Czech glass stitch marker. And I was able to finish the April samples and send them with the March ones. 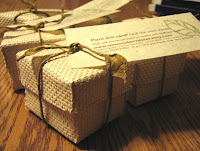 Little gift tags suitable for fiber artists -- stamped with a leaping lamb on paper embedded with wildflower seeds and packaged in a woven box made with recycled materials. 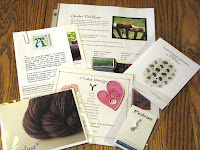 Are you interested in purchasing a PhatFiber box? They've grown to be such a phenomenon that the March boxes sold out in less than 2 minutes. How to get one? Register with the PhatFiber folks -- they'll send you an email letting you know when the boxes go on sale in April. Then visit the Etsy shop and start refreshing your browser as quickly as you can to catch a box as it's listed. Good luck! Heather, I really picked up on the "might start spinning again" Super!